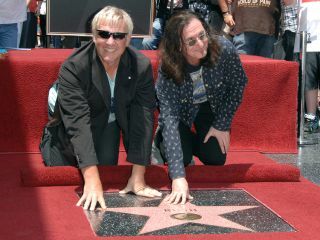 Rush received a star on the Hollywood Walk Of Fame last Friday, appropriately in front of the Musicians Institute on Hollywood Boulevard. And while their star was number 2412 and not 2112, as many of their fans might have preferred, Alex Lifeson and Geddy Lee, both of whom were in attendance, were nonetheless pleased by the honor. Noticeably absent was drummer and lyricist Neil Peart. The notoriously press-shy Peart was said to be riding a motorcycle to the band's first tour date in Albuquerque, New Mexico on Tuesday. On hand to induct the musicians were Smashing Pumpkins singer Billy Corgan and Donna Halper, a former music director at Cleveland's WMMS-FM who was among the first to champion the band's 1974 self-titled debut album. "Rush always stayed true to themselves and true to their music, and never lost their integrity," Halper said to cheers from the crowd that ranged from toddlers in Rush T-shirts and their parents in tattered vintage '2112' tour jerseys. Corgan told the crowd, "If you would've told me in the basement of Glendale Heights, Illinois in 1975 that I would be standing with these guys, I think my head would've exploded. I've been in this business for about 20 years now, and let me tell you, thee guys are the best of the best. They represent the values that the fans will listen, and will care." Lifeson and Lee offered sincere and humor-filled acceptance speeches. Calling the event a "beautiful, surreal moment: in the band's 40-plus-year career, Lee said, "From the suburbs of Toronto to a star on Hollywood Boulevard - that's quite a trip!" The Walk of Fame induction comes on the heels of the launch of Rush's 40-city North American Time Machine Tour in support of the new single, Caravan, released 1 June, from the band's 20th album, Clockwork Angels, due next year.